Comedian/TV Host Steve Harvey Meets Up With President Elect Donald trump ! 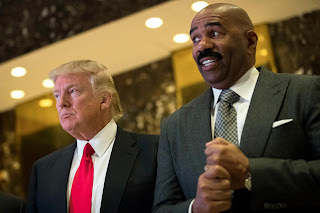 BHR Hollywood Reports...........TV host Steve Harvey was the latest celebrity to drop in for a meeting at Trump Tower on Friday. And now he's explaining what it was all about. "Our president (Obama) asked that all of us sit down and talk to one another in order to move our country forward," the host of Family Feud and The Steve Harvey Show noted in a statement posted to Twitter. "The transition teams on both sides asked me to meet and I'm glad I did." 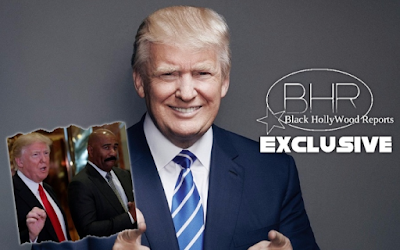 Harvey said that Trump "immediately got (HUD secretary nominee) Dr. Ben Carson on the phone to begin dialog in looking for programs and housing to help our inner cities." He added that the president-elect "seems very open to my mentoring efforts across the country." He added, "I walked away feeling like I had just talked with a man who genuinely wants to make a difference in this area. I feel that something really great could come out of this." Harvey's bottom line? "I would sit with him anytime." Fox News also got a quote from the Family Feud host, who called the invitation "an honor" before adding that "we're off to a good start." Harvey said last February that, though he did not endorse Trump, he believed that the former Celebrity Apprentice host would make politics exciting again. "Donald Trump — we've seen nothing like him in politics before," he told the Daily Beast. "He's very entertaining to me. I've got to tell you. I can't take my eyes off of the man when he's talking — mostly because I can't believe he's saying what he's saying out loud... But I like him, personally. I do! I think he's exciting for politics. Politics haven't been this exciting in a long time."